我架站的第一選擇是使用 CentOS 但這一次因為 Drupal 7 需要使用 PHP 的版本須為 5.2.0 以上,但目前 CentOS 5 還是 5.1.x 的版本,而 CentOS 6 也還沒準備好.所以這一次試用了 Ubuntu 11.04 + drupal 7 . 雖然 Ubuntu 有區分 Desktop 版和 Server 但我還是選擇了 Desktop 版本來使用,原因之一是 Ubuntu Server 版不提供桌面系統,所以我的做法是將 Ubuntu Desktop + apt-get 將需要的服務下載安裝.要讓 Drupal 順利運作需要下列套件. 第一個要啟動的服務就是 Apache. (Apache 是一種 Web Server ,和 Windows 的 IIS 是一樣的功能). 透過 web browser 瀏覽器連上你 http://localhost, 如果 httpd 能正確運作,那你可以看到內容如下面一樣的網頁. Drupal 主要透過 PHP 的程式語言架構出來的,而 PHP 是一種直譯式的程式語言,用於網頁的撰寫,不同於靜態式的 HTML 它可以依據使用者的需求來呈現不同的網頁內容. /var/www 是 Apache 預設的目錄,你可以修改 /etc/httpd/conf/httpd.conf 修改 DocumentRoot . 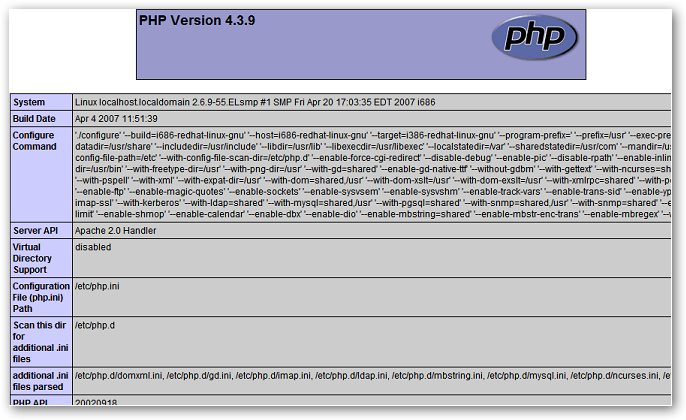 <?php phpinfo(); ?> 這是 PHP 的格式,未來使用 drupal 的內容大部分都是使用 PHP 來顯示,不過不用擔心.我們不需要懂 PHP ,Drupal 會幫我們處理一切.開啟你的網頁連上你 http://localhost/phpinfo.php ,如果一切運作正常那你會看到和下面一樣的網頁. 因為 drupal 會將資料儲存在 database 中,我們用 Linux 常使用的 MySQL 當成我們的資料庫系統. 安裝完成後系統會要求建立 root 的密碼,這個 root 是 MySQL 的使用者,和系統上的 root 是不一樣的帳號,這一點不要搞混. 非必要性,你可以選擇安裝或是不安裝.Drupal 7 需要建立 mysql 資料庫,mysql 只提供命令的方式建立資料庫,透過 phpmyadmin 是另外一種不用記命令透過 web 方式進行 mysql 資料庫的建立. 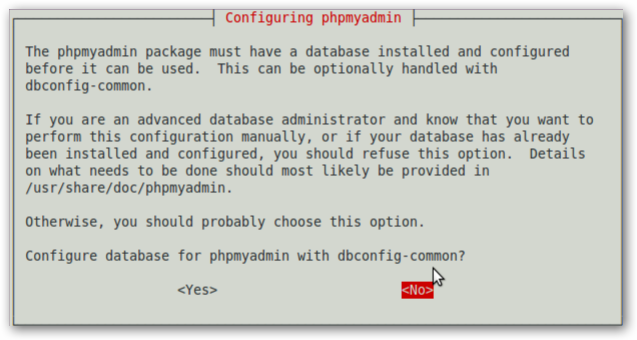 再安裝過程中 phpmyadmin 需要選擇 Web Server 的種類,在第一步驟中我們始使用 Apache 來當作系統預設的 Web server, 所以這邊一樣選擇 apache2 當作 phpmyadmin 當做預設的 Web server. 回到 web browser 瀏覽器連上你 http://localhost/phpmyadmin ,這邊的帳號密碼為 mysql 的 root username 以及 password. 開始建立資料庫,我們要為將來使用的 drupal7 建立一個資料庫名稱也是 Drupal ,按下 "create" 這樣資料庫建建立完成了.